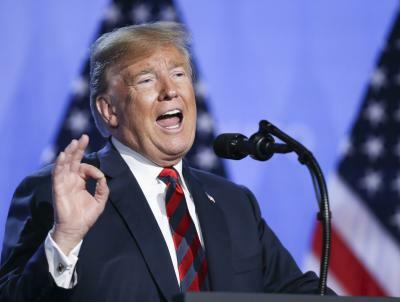 London July 12 (IANS) US President Donald Trump arrived here on Thursday on a two-day visit and said he is "fine" about the protests expected to be held during his tour saying Britons "like me a lot". He is scheduled to meet British Prime Minister Theresa May who wants a post-Brexit trade deal days after he said the UK was in "turmoil". Extra security was put in place ahead of a number of planned protests the BBC reported. Trump who will also spend time with the Queen during his stay said: "I think they like me a lot in the UK. I think they agree with me on immigration... "You see what s going on throughout the world with immigration... I think that s why Brexit happened." He said the British people "voted to break it up so I imagine that s what they ll do" and "Brexit is Brexit". Trump has been under fire for his own immigration policy which resulted in the separation of immigrant families. Protesters were expected to rally during his visit. The US Embassy warned American citizens in the UK to "keep a low profile". There has been an ongoing social media campaign to make rock band Green Day s 2004 song "American Idiot" No. 1 in the UK by the time Trump arrives. A 19-foot-tall orange balloon shaped to look like a baby version of Trump will be flown in central London. Anti-Trump demonstrations were expected to take place in Bristol Newcastle Leeds Cambridge and Cardiff. A protest was expected to take place near Blenheim Palace in Oxfordshire the venue for Trump s black-tie dinner with May. On Friday demonstrators are expected to gather near Chequers the Prime Minister s country residence where May and Trump will hold a working lunch. There will also be a "Stop Trump" march in central London expected to be attended by thousands. The US President reached here after attending a Nato summit in Brussels where he said member countries agreed to increase their military spending. May said the US leader s UK visit would be an opportunity to boost trade links and strengthen co-operation on security. But she also warned Trump not to ignore the "malign behaviour" of Moscow when he meets Russian President Vladimir Putin in Helsinki next week. Her office said that she expected Trump to discuss with Putin issues like the Salisbury nerve agent attack on former spy Sergei Skripal and his daughter Yulia. Along with trade and security links 10 Downing Street said the other key areas to be discussed between May and Trump included Brexit and the Middle East.